3118 Mangifera indica - Ice Cream Mango, Grafted ? 'Ice Cream' is far and away the most popular of the "condo mangos." Dwarf tree, small green fruit w/ yellow flesh. Flavored like name. The tree can easily be maintained at a height of just six feet making it ideal for container growing. Although the fruit is not exactly dessert to the eyes the flavor is sweet, rich, and reminiscent of mango sorbet. 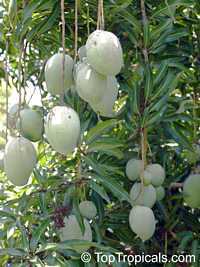 4475 Mangifera indica - Ice Cream Mango, Large size, Grafted ? 'Ice Cream' is far and away the most popular of the condo mangoes. Dwarf tree, small green fruit w/ yellow flesh. Flavored like name. The tree can easily be maintained at a height of just six feet making it ideal for container growing. Although the fruit is not exactly dessert to the eyes the flavor is sweet, rich, and reminiscent of mango sorbet.